Rare, high quality petrified wood 3? slab top side table. Stunning grey and white tones with visible crystals. Set on a modern stainless steel base. Pair available. The price reflects one. 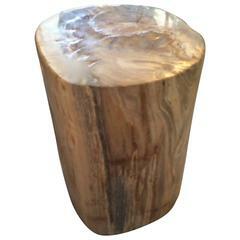 We source the highest quality petrified wood available. Each piece is hand selected and highly polished with minimal cracks. Petrified wood is extremely versatile – even great inside a bathroom shower. Perfect as a cocktail table, side table or clustered as a coffee table. We can also custom large slabs for counter tops, dining or coffee tables. We have an ever-evolving collection of high quality petrified wood. We only select the best. Andrianna Shamaris. The Leader In Modern Organic Design.